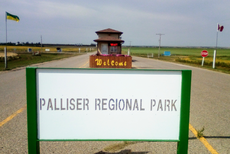 Palliser Regional Park offers camp sites that can be rented for the entire camping season. Unfortunately for potential patrons, these sites are in extremely high demand; park administrators maintain a waiting list and may be able to offer information on availability. Please contact the park office for more information. The following documentation was provided to all seasonal site permit holders via e-mail on 12 Dec 2014. It details the new camping rates and the information used to arrive at those rates, as well as information on invoicing. The regulations applicable to seasonal sites for the 2015 camping season have been posted. If you have a seasonal site, please familiarize yourself with and plan to abide by these rules to make the season enjoyable for all.